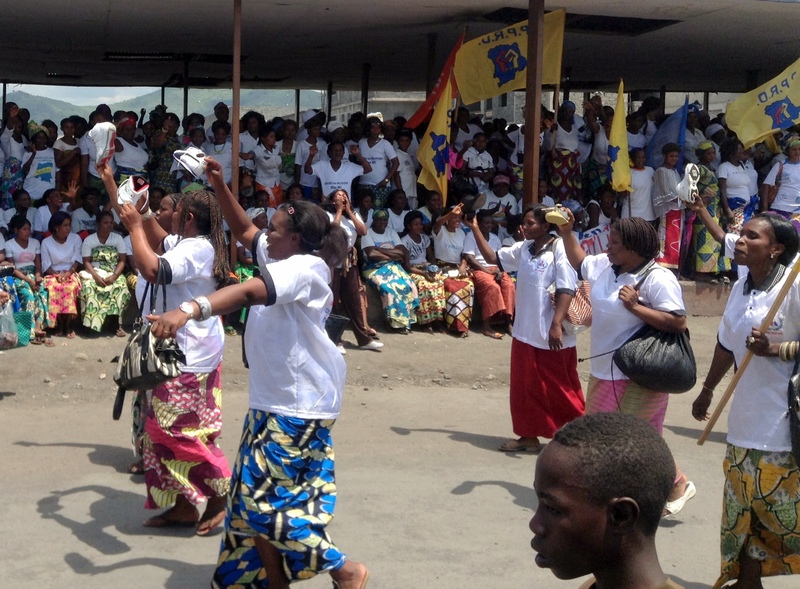 Women in Goma marched in the streets to celebrate the defeat of the M23. I have heard tragic reports of rising conflict from our partners in the Democratic Republic of Congo. Eastern DRC has been engulfed by conflict since 1994, when Hutu militias fled across the border from Rwanda—where they had just slaughtered Tutsis and moderate Hutus in one of the most organized genocides of the 20th century. But in November 2013, we have started seeing signs of hope. The notorious M23 rebels have finally surrendered, after years of unrelenting attacks against both civilians and the DRC military. 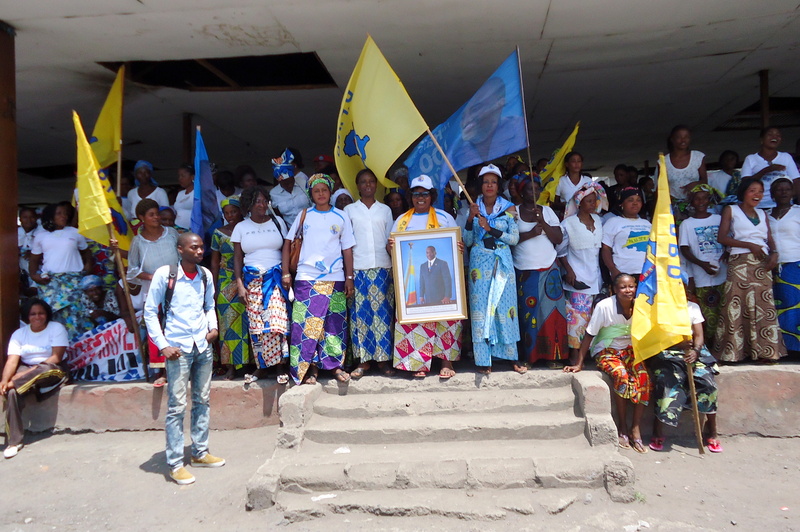 Here in DRC, people have been celebrating this important milestone. 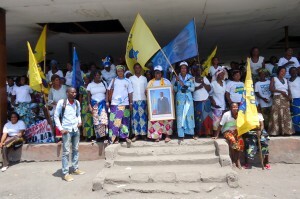 Women have dressed in white to show their support to the Congolese army and government in Goma and Kinshasa. There is a festive mood in the air. However, grassroots advocates for peace are also calling for caution. People are waiting to see what happens next and how the pending peace negotiations between the government and the M23 unfold. Still, this is a huge step toward breaking the cycle of recurrent violence in the Eastern DRC. We hope the United Nations and the Congolese army succeed in fighting the remaining rebel groups. There will be challenges ahead, particularly when human rights groups seek justice for war crimes—but this is a huge first step. Read on for reflections on this news from AJWS partners in Goma and Bukavu, DRC, who will continue working with their communities to recover from this conflict and demand their basic human rights. “The defeat of the M23 rebels represents a significant opportunity for peace in Eastern DRC because it enables the Congolese and their army to regain confidence in themselves. This victory provides a basis for rebuilding the Congolese army. However, recurrent conflict remains an issue. The lack of governance here fosters the breeding of armed groups, led by people who use ethnic and tribal tensions to manipulate people. I am convinced that with more political will and improved governance, it is possible to stabilize Eastern DRC and to dissuade neighboring countries from attempting to venture into Congo for one reason or the other. “We are satisfied by the surrender of the M23. This happened at a time when many people felt unsafe in North Kivu province, and it is putting an end to catastrophic attacks against civilians by this armed group. This is a huge step toward bringing about peace. However, given the scale of human rights violations committed by the M23 rebels, it important that all perpetrators of crimes now be brought to justice. We ask the international community to respect the peace framework that so many countries signed in Addis Ababa, Ethiopia, this year, which obliges countries to NOT provide refuge to members of armed groups who engaged in actions to destabilize other countries. Thus, nearby countries must not harbor the leaders of the M23, who are wanted by national and international tribunals and must return to face criminal trials. “We are satisfied and congratulate the Congolese army and the United Nations intervention brigade for this victory, which marks a decisive turning point in the peace process in eastern DRC. We commend the mobilization of the Congolese population and the international community. Though it is too early to draw a conclusion about the effects of the defeat of the M23, we hope that it will dissuade all other armed groups from continuing their attacks. To create lasting peace, we believe it is necessary for the DRC government and the United Nations Organization Stabilization Mission in the DRC to set up a coherent plan for peace in areas formally controlled by the M23 and to restore government authorities in areas controlled by other armed groups. Both armed rebel groups and members of the national army in DRC must stop violating human rights and international humanitarian law. We must address the factors that foster this systematic impunity, including the weakness of the judicial system, a lack of state authority and a lack of political will to pursue the perpetrators of crimes. 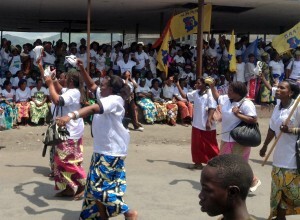 Women in Goma gathered in the marketplace to celebrate the M23 defeat. “It’s a great relief for us Congolese, especially women who live in North Kivu province, that the M23 is finally defeated and dissolved. We are really happy that two decades of atrocities are gradually coming to an end. This is a big step towards the restoration of the rule of law, but we still have work to do. On the one hand, we need to keep our eyes open to prevent enemies of peace and development in the DRC from using excuses to try to destabilize our country. Soldiers from the Rwandan army are still present on the Congolese soil in Murambi, which is located within three kilometers from Goma. We call upon the international community to take notice of that. These contributed statements reflect the opinions of their authors. This blog post does not necessarily represent the policies or perspectives of American Jewish World Service. 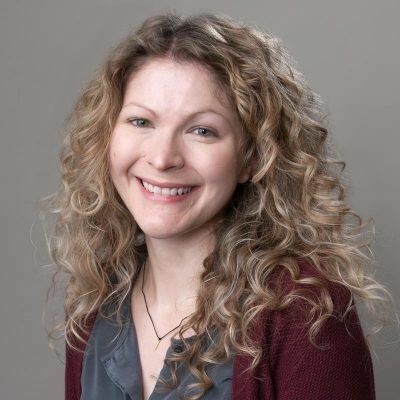 This post was translated from French to English by Rosalie Nezien, AJWS program officer, and edited by Elizabeth Daube, AJWS communications officer. Photos by Rosalie Nezien.